Exciting news! Beginning in the summer of 2019, Get In The Wild will offer the first guided technical canyoneering adventures in the Pacific Northwest (PNW). The tours will be offered in the spectacular North Cascade Mountains near Seattle, Washington. The North Cascades offers some of the most magnificent, remote and awe-inspiring alpine landscapes in America. Get In The Wild offered it’s first canyoneering courses in the PNW in 2010. As the only local, PNW-based canyoneering company, we have spent the past twenty-three years in this amazing backcountry. We have combined knowledge, skills and experience taken from our alpine mountaineering and glacier climbing programs to create the first Alpine Canyoneering Program in America. We are excited to share this knowledge and experience as part of a newly designed Alpine Canyoneering Training Program. This program will provide the most comprehensive set of canyoneering skills designed specifically for PNW canyoneering. The program will include three separate 4-day modules including: (1) basic canyoneering skills and ropework, (2) swiftwater skills and (3) alpine skills. The 4-day program length is designed for flexibility to provide students with options tailored to their individual backgrounds and expereince. Over the past twenty-three years we have learned in order to safely experience the rugged and wild landscapes of the PNW, one has to be very well-rounded with a comprehensive set of wilderness skills. To visit these areas often requires skills in off-trail bushwhacking, backpacking, rock climbing, ice-climbing, canyoneering and glacier mountaineering. We have brought together skills from each of these fundamental areas in creating this exciting new Alpine Canyoneering program—the first of its kind in the PNW and North America. We are very excited to share this knowledge with intrepid, wilderness explorers who share our passion for exploring and experiencing some of the most spectacular and unexplored landscapes in Washington state and the Planet. Join us for an action-packed adventure in the canyon made famous by Aron Ralston in the epic Hollywood movie—127 Hours. Bluejohn Canyon is a physically challenging canyoneering adventure that includes tight narrow slots, exciting potholes, spectacular down-climbs and awe-inspiring rappels. This fun, technical slot-canyon has some of the most beautiful slots in the spectacular Robbers Roost Wilderness made famous by another Hollywood epic—Butch Cassidy & the Sundance Kid. This amazing canyon system includes three separate forks that can be enjoyed as a single-day, or multi-day adventure. Fewer Crowds: Tourism in Southern Utah peaks in spring after winter has melted away and the wildflowers are blooming, and in summer when kids are out of school and parents rely on the great outdoors for family time. Fall is a quieter season in canyon country and offers more breathing room and solitude to explore the vast wilderness. Enjoy fewer cars on the road, no lines to get in and better rates for lodging! Ideal Weather: Strong gusts of winds howl through Southern Utah during the springtime but tend to dissipate in the fall. Additionally, temperatures are typically 70-75 degrees with sunshine making for pleasant adventures in canyon country. Fall Colors: When thinking about the best places to see fall colors in the country, red rock country is not what usually comes to mind, but it couldn’t be further from the truth. There is a range of opportunities to admire the cottonwood and aspens turning from green to golden in Southern Utah. The canyons are dotted with grand cottonwoods that make a striking contrast against the warm red canyon walls. Drive up into the Henry Mountains to admire a forest of aspens making the transition to fall. As yoga steadily gains popularity, yoga studios are saturating the market like Starbucks. The abundance of studios makes it tempting to keep your practice confined within four walls. While many yoga studios are cozy, serene and welcoming places, studios can't compete with the awe-inspiring beauty of nature that is ever present. As Labor Day approaches, you may be looking towards the fall but don't discount summer yet! There is still plenty of time left to take your practice outside into the days of summer. And there are plenty of reasons to do so. Sun – Nothing new here but a reminder that vitamin D provides many physical and mental health benefits. Don't forget to apply a natural sunscreen before stepping outside. Mix it up – Perhaps you are like me and you have reached periods of burnout from your yoga practice. As the teacher guides you through another sun salutation you are secretly thinking "How many of these have I done in class already today? Can't we do something different?" By taking your mat outside, you add variety to your practice and take preventative measures against yoga burnout. Birds and Bees–When you practice outside, you are connecting with the roots of your being - all of our beings – Mother Earth. Take the time to reconnect with nature. Close your eyes and take in the sounds of the birds calling in the distance, the scent of fragrant blossoms, and the feeling of the subtle breeze on your skin. Let life be simple. Check with local yoga studios- Many studios are starting to offer outdoor yoga classes in the summer. Gather a group of friends – Round up your nearest and dearest yoga buddies for a fun, impromptu outdoor gathering. Hire a Teacher – If you can't find any outdoor yoga classes, propose the idea to your favorite yoga teacher or hire a teacher! Retreat to the outdoors – Find a retreat that takes place outside (camping, in the jungle, at the beach, etc.) or incorporates outdoor yoga classes as part of the retreat. Bio: Melissa is looking forward to taking her yoga practice outside this fall at the Red Rock Yoga and Hiking Retreat in otherworldly Goblin Valley, Utah with Get In The Wild Adventures. Besides practicing yoga with goblins, Melissa founded and directs the Northwest Yoga Conference which takes place in the Seattle, WA area each February. Your Canyon Country Adventure Starts Here! Exciting New Adventures Beginning Spring 2017! Great news! Beginning in March 2017, Get In The Wild was granted a Commercial Use Permit to operate in the magnificent, remote and awe-inspiring San Rafael Swell adjacent to Robber's Roost Country. 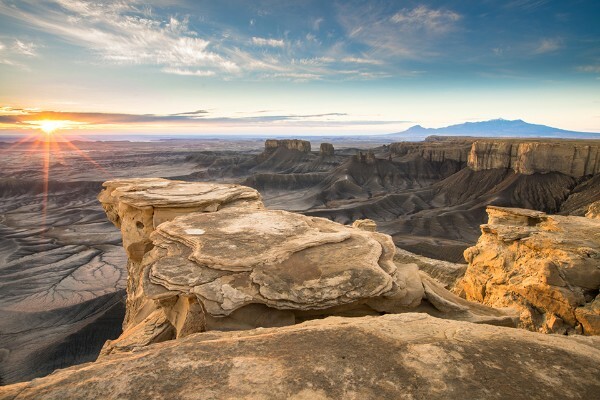 The "Swell" is a 75 mile long by 40 mile wide anticline, or uplift in the Earth's surface that have eroded the surrounding terrain into a spectacular labyrinth of colorful valleys, canyons, mesas and buttes. A myriad of new places to explore are located in this wild, undiscovered landscape. New tours for spring 2017 include The Occulus, Zero Gravity, Five-Window Arch and a new Outlaw Tour to Bill Tibbett's Cave--the last of the Robber's Roost outlaws. Due to the great success of our 2016 Photography Workshop with Bill Church Photography, we have scheduled another 3-day photography workshop at the Robber's Roost/Dirty Devil Wilderness. During this workshop, we will cover camera functions, depth of field, night photography, light painting, digital editing, and image composition. All experience levels are welcome. Accommodations will be Basecamp-style. We will set-up camp in a remote, wilderness location and explore from there. It is the best of both worlds - you get to experience solitude at it's finest, but don't have to worry about fitting all of your camping and photography gear into a single backpack. Book your reservation now and save your spot for this exciting and informative adventure! Want to explore some of the North America’s most spectacular and awe-inspiring technical canyons with names such as Leprechaun, Larry, Bluejohn, Chambers and Mindbender? Looking to have fun in the canyons, learn essential safety skills, and experience the unique camaraderie and power of the “team”? This course will provide you a well-rounded base of technical canyoneering and canyon leadership skills that are essential for achieving these goals. Have We Mentioned That Canyoneering Is Fun! 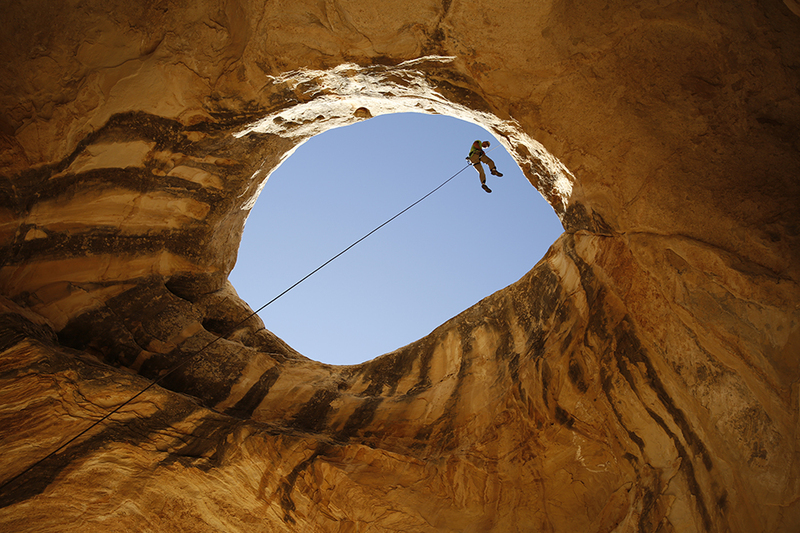 Unlike many courses which are taught at climbing walls, this course is taught in actual technical slot canyons. Matter of fact, the areas we teach in have some of the best technical slot canyons on the planet. We believe there is no substitute for learning canyoneering in actual canyons. We're confident that once you see our incredible outdoor, wilderness classroom, you too will agree. We only have a few spots remaining for our April 28-30 course. Register today to reserve your spot! Adventure, joy, relaxation--these are a few words that describe the unique experience awaiting you on a Yoga in the Wild outdoor adventure retreat. Combine yoga practice with hiking and exploration in a transformational setting that encourages attendees to cultivate mindfulness in the present moment. Take a break from the daily barrage of information and discover yourself anew in the spectacular redrock canyons. Reservations are available for all of our most popular programs including half, single and multi-day canyoneering adventures; technical canyoneering courses, wilderness backpacking, vehicle basecamp safaris and Yoga In The Wild trips and retreats. Drop us an email at and start planning your next adventure! Send us an email at , or call us at (818) 381-WILD for more information. Extraordinary Adventure Vacations In North America's Wildest Places! Come and explore one of America’s most beautiful and amazing wilderness areas; a vast and extraordinary landscape of sweeping slickrock, beautifully sculpted sandstone cliffs and narrow twisting canyons that have challenged and amazed wilderness adventurers since the late 1800’s. Our adventures through this explorer’s paradise take us through some of the last known places to be mapped in the United States. Travelling through this region provides a feeling of remoteness, ruggedness and awe that are unmatched in the modern world. For many, their first experience in canyon country is transformational in nature. It becomes an intrinsic part of their heart and soul that serves to draw them back time and time again. 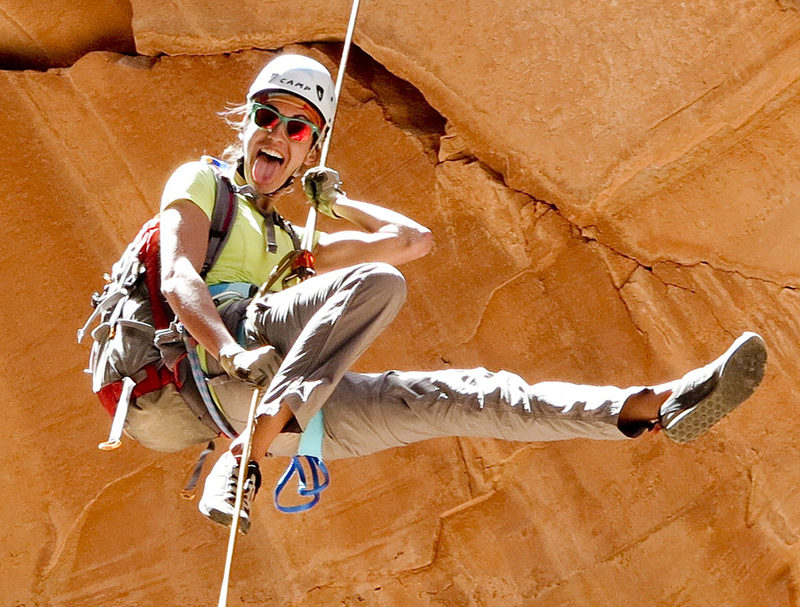 We have an exciting variety of canyoneering trip offerings in 2014 to suit most every wilderness traveller. Some of our offerings include Canyoneering Day Trips, Multi-Day Tours, Family Adventure Tours, Photography Tours, Natural History Tours, Leadership Education and Yoga in the Wild Adventures. 2014 trips are booking fast. Please contact us at: to book your trip, or for additional information. Join Get In The Wild on one of our exciting redrock tours during the months of October and November. We operate in some of the most beautiful and awe-inspiring wilderness areas in the Southwest--most of which are unaffected by the current governement shutdown. 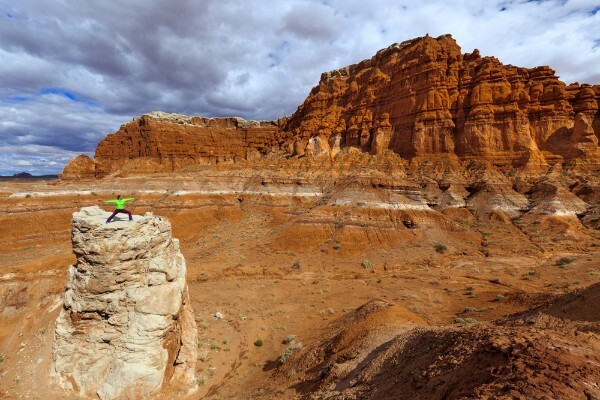 From exciting slickrock hiking, canyoneering, backpacking and photography tours to natural history tours, Yoga In The Wild trips and family adventure vacations, we've got a trip for you! Exciting news for us at Get In The Wild. We recently learned that one of our canyoneering videos will be featured on the Discovery Channel this fall. They are producing a new wilderness survival program that will highlight a lone survival...ist that is dropped off somewhere in the middle of nowhere. This individual will be given 100 hours to successfully escape his situation. Discovery requested to use our video to highlight some of the hazards he or she might face. Pretty cool! Glacier Peak & North Cascades Adventures - Free Info Session! Want to experience the adventure and solitude of climbing the most remote volcano in Washington—Glacier Peak? Want to climb Mt. Fury, Eldorado or other majestic, glaciated alpine peaks in the spectacular and awe-inspiring North Cascades? Looking to have fun in the mountains, learn essential safety skills and experience the camaraderie and power of the "team"? Come learn about these exciting alpine destinations in this free informational seminar. Join us on Tuesday, June 25th, 6:30 PM at Marmot Mountain Works in Bellevue, Washington. Marmot is located at 827 Bellevue Way, NE, Bellevue, WA. For more information please contact us at , or (818) 381-WILD. Come and discover the beauty and magic of winter on a Family Snowshoeing Adventure in the North Cascades. On this unique wilderness adventure, you will learn how to safely ascend and descend mountainous terrain, keep track of your position even if your route becomes obscured by new fallen snow, winter hazard awareness, winter preparedness and snowshoe equipment use and care. Additionally, Get In The Wild’s expert instructors will share their knowledge of the mountains and guide you to some of the most secret and unexplored areas of the North Cascades. Join Get In The Wild Adventures for an amazing wilderness snowshoe adventure that you and your family will always remember. 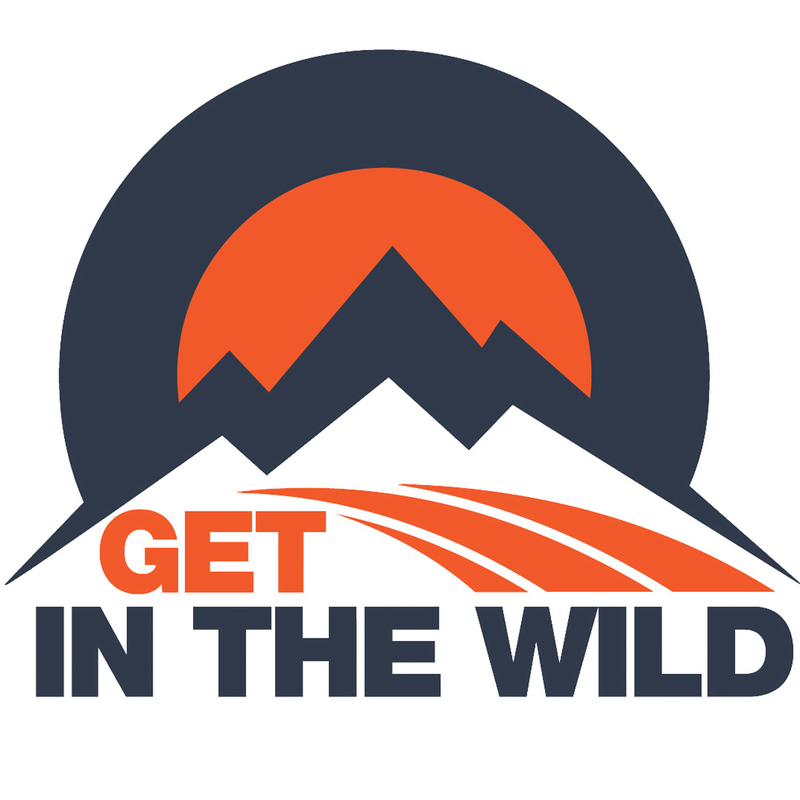 www.getinthewild.com. (818) 381-WILD. Fall Canyoneering Trips Start Soon; Join Us For a Wilderness Redrock Vacation You Won't Soon Forget Including Our Highly Sought Canyoneering Basecamp Adventure! Guaranteed solitude in some of the most beautiful, rugged and unexplored regions of the Colorado Plateau. Some of the areas that we operate include the Dirty Devil Wilderness, Robbers Roost Wilderness, Fiddler Butte Wilderness and French Springs Wilderness. We are also the only guide service operating in many of these areas. Flexibility in your daytime activities. We can put together a diverse variety of day trip options from easy to difficult that include slickrock hiking, desert hiking, canyoneering, natural history, or photography. Additionally, if anyone in your group has an interest in yoga we can also include some complimentary Yoga In The Wild in your itinerary. We offer wilderness-based yoga retreats and adventures and can incorporate this into guests schedules who have interest. Luxurious basecamp complete with camp kitchen, drinking water, hot showers, lounge chairs and bathroom facilities. Healthy and delicious meals which include a hot breakfast and dinner each day as well as a packed lunch for our daily hiking adventure. Campfires complete with good conversation as well as a variety of tasty treats to enjoy around the fire. Join us this Fall for a wilderness adventure vacation of a lifetime with Get In The Wild Adventures. www.Getinthewild.com. (818) 381-WILD. 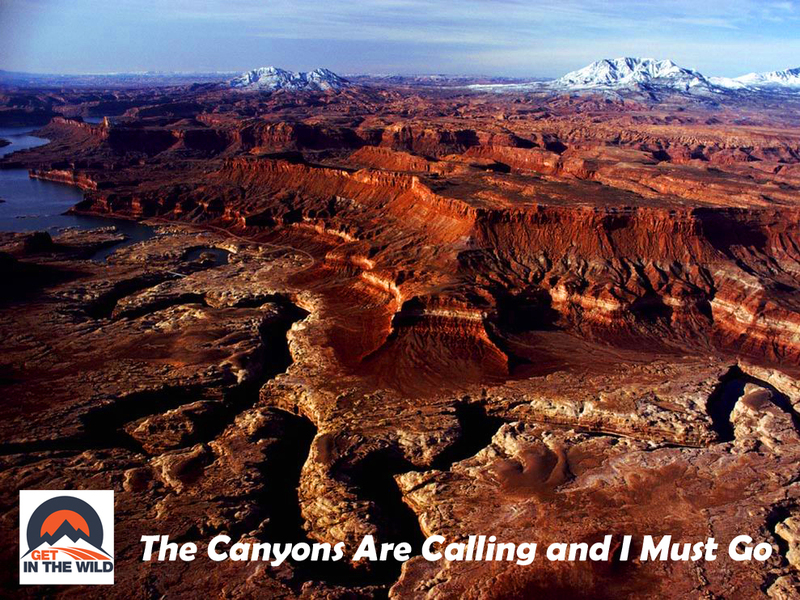 Great news for fans of the beautiful and awe-inspiring red-rock canyons of Southern Utah. We just received our 2012 Commercial Use Permit for Capitol Reef National Park. We have a variety of exciting canyoneering trips planned which include some of the best slot-canyons in the Southwest. For those unfamiliar with the park, it is characterized by colorful sandstone formations, cliffs, canyons, ridges, buttes and monoliths. It’s most stunning geologic feature is a 100 mile long warp in the Earth’s crust known as the Waterpocket Fold. This 65 million year old fold is the largest exposed monocline in the North America. It is comprised of younger and older layers of the Earth’s crust which were folded over each other in an S-shape. This striking geologic feature was probably caused by the same collision of continental plates that created the Rocky Mountains. It has weathered and eroded over melinnea to expose a fascinating amalgam of brilliantly colored sandstone cliffs and canyons, gleaming white domes and contrasting layers of intricately shaped rock and sand. North American Wilderness Leadership School is looking for qualified instructors, interns and assistants to help us with our 2012 wilderness education programs. We have a diverse list of sixteen different wilderness education courses and guided trips that include Alpine Mountaineering, Canyoneering, Backpacking, Scrambling, Winter Mountaineering, Photography, Natural History and Wilderness Leadership. If you have an interest in helping others learn essential outdoor skills, are looking to improve your own skills, or are interested in a career in wilderness education, please contact us at: , or (360) 391-0124. For more information please visit our website at: www.getinthewild.com. Job descriptions can be downloaded at: Home Page/Resources/Employment. Great news for fans of North Cascades National Park and Picketeers everywhere! We just received word that our Commercial Use Permit for 2012 has been approved. For those looking for a well-rounded mix of backpacking through old-growth forests, hard-core steep bushwhacking through Devils Club and a wide variety of dense vegetation, magnificent alpine traverses, glacier mountaineering and alpine rock climbing--join us for one of North America's greatest adventures in the summer of 2012. Welcome to the "Get In The Wild Newswire"
At North American Wilderness Leadership School we are proud to provide a great social networking platform that makes staying in touch fun and easy for the Get in the Wild Community. These features provide a covenient way for our community to get involved and keep up to date on new courses, programs, gear reviews and what all of our friends are up to. Specific features include the Get In The Wild Blog, Facebook style networking, photo gallery, video galley, private groups and event management. Feel free to set up your free profile and explore our great wilderness adventure community.